Yesterday, at work, (I can knit, and do knit at work) I cast on again for the fingerless gloves--the Fruity Fingerless Gloves--since the solid colorways are named Raspberry and Grape-the hand painted yarn is named with a number, but it is shades of raspberry, and cherry, and strawberry and grape--a fruity combo of colors. A 2 color tubular cast on, using the solid raspberry and grape yarns, (Mode Dea Washable Wool) some ribbing, 1 X 1, natch, and some stripes. 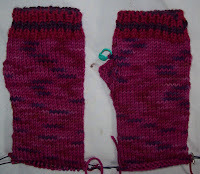 The fingerless glove itself, -stocking knit—and again, knit from the fingers end to the cuff. Before I left work I had the thumb gusset started—a |/ one—not a V shaped one. (My personal favorite style thumb gusset)--and I got a lot done on the subway ride. Stocking knit if fast knitting, and each round is just 36 stitches--and 8 rounds an inch! They could have been longer, but I saved some yarn—a few yards from each glove. These scrap of yarn will be the cast on and ribbing of a matching hat—The body of the hat will be stripes of the solid contrasting colors. Not a match in the most conventional sense, but more of go together sort of thing. Still there are stripes of the solid colors as ribbing, and the hat will feature stripes of the solid colors in stocking knit. With ribbing in the hand painted ArtYarn. Late in the month, I got on the bandwagon, and put up the Rip Off, no, I mean, Rib Off Hat on Ravelry for sale. The proceeds from the sale were earmarked for Help for Haiti. As the month ended, 8 copies of the pattern had been sold, and this generated $24-(less Ravelry’s handling fee). So I am pleased to say, a $25 dollar donation is being sent to Doctors Without Borders— my pattern sales are a small contribution (some designers have generated thousands of dollars of sales) but I am pleased to have done this small part. So I need to thank you—It pleases me no end that you like the pattern enough to purchase it, and it pleases me more to make the contribution to help those in need in Haiti. Meanwhile, JelliDonut has completed the first hat—she was the spark that started the project, and she test knitted the pattern—she hasn’t yet linked in Ravelry. For now you’ll have to follow the link to her project page--since Ravelry is balking at linking it to my pattern. 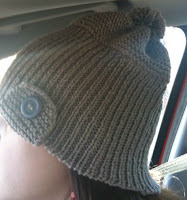 In the meanwhile, for you none Ravelry readers, here is her image of her DD modeling her version of the hat. I’ve cropped away most of DD’s face—and love that this image shows the cast on detail—the detail that makes the hat special. You can also read her thoughts about the hat on her blog. Finally got the pattern link to work on Rav--yeah, it was me all along. Take me across a couple of time zones and I lose brain cells. You are too sweet by a mile! Love the mitts, and the idea of using the leftover - such good ideas, always, Helen!